Holiday Suites Houthalen-Helchteren in Houthalen-Helchteren - the best offers! Holiday Suites Houthalen-Helchteren is situated in one of the last unique pieces of unspoilt nature in Belgium. You can enjoy walking or cycling through the wooded area. This price applies to 5-person apartment 50+, with the arrival as 6 May 2019, 2 Nights. This price applies to 8-person apartment 80+, with the arrival as 6 May 2019, 2 Nights. 100% van de totale reissom moet betaald zijn binnen 14 days before arrival. Holiday Suites Houthalen-Helchteren is situated in one of the last unique pieces of unspoilt nature in Belgium, and it’s for good reason too, as this region is also known as the 'green lung of Belgium' – it’s purely in nature, surrounded by forests and vast fish ponds, where beautiful hiking trails and cycle/mountain bike routes provide the peace and relaxation you deserve, coupled with the excitement you may wish to seek.. Surprise the children with a day at Plopsaland and treat yourself to an afternoon of shopping in Maasmechelen Village. 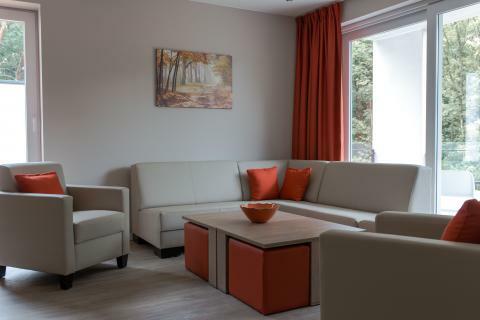 Holiday Suites Houthalen-Helchteren is a quiet, recently renovated apartment complex in Houthalen-Helchteren, Belgium. The park is surrounded by nature, between the woods and vast ponds. 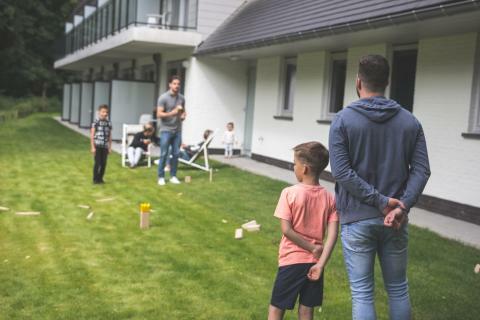 Suites Houthalen-Helchteren offers you entertainment in the form of boules and tennis courts, and in the vicinity, you can fish in several ponds. The park has free Wi-Fi, as well as an infrared sauna and a swimming pool. For the little ones, there’s some play equipment. Holiday Suites Houthalen-Helchteren also has an outdoor swimming pool, and for a fee (with a discount) you can use the facilities of the nearby Hengelhoef Recreation Park, which includes a subtropical swimming paradise and an indoor play area. At Holiday Suites Houthalen-Helchteren you will find tavern/brasserie De Bosrand, where you can have breakfast, lunch and dinner. If you’re looking for more varied restaurants, it couldn’t be easier to get to the city of Genk, where you can find every cuisine under the sun. For those of you that would rather cook up your own delicious feast, there’s an abundance of supermarkets in Houthalen-Oost and Genk, where you will find everything you could possibly need. Holiday Suites Houthalen-Helchteren is located in Central Limburg in Belgium, close to the shopping cities of Genk (8km) and Hasselt (20km). Also nearby is Maasmechelen Village (23km), a complete outlet shopping centre. For motorsport lovers, the circuit of Zolder (17km) is nearby, and for the children, a visit to Plopsaland, the indoor adventure park in Hasselt, is a must! Cinema lovers can also then visit the Kinepolis cinema in Hasselt. The area also offers many leisure and recreation opportunities within walking and cycling distance. The extensive cycling routes lead you along the most beautiful spots and sights in the area. In this unspoilt nature surrounded by forests, vast meadows, waving landscapes and flowering moorlands, you will undoubtedly find peace and quiet in this unique part of Belgium.